Gaudí: Casa Milà "La Pedrera"
Paco Díaz (Palma de Mallorca, Spain) on 27 May 2009 in Architecture. Very well done. It seems as though this building is alive and at any time it might take off walking. Very nice. Je connais ! très belle photo, magnifiquement cadrée ! with each picture you post with something from Barcelona you make me wanna go there. and i will with the first opportunity. well captured. belle architecture très particulère, des murs qui suivent les sinuosités de la vie ..une lumière blonde..tout en douceur..
That is an amazing looking building! Great shot Paco! This has a lot of interesting curves and shapes! Wow, that is strange and interesting architecture. I like Cricket-Tammy's comment that it looks alive! Fascinating architecture here. Nicely composed. Not easy to take the whole building. You had to use the 14mm FL. Wow, what an amazing architecture!!! This is quite a place... so full of life! Love your tonality Paco! Muy buena fotografia de unos de los simbolos de barcelona, excelente trabajo. Unmistakable . . what a curious style this is and, in this setting, it looks almost organic. Muy buena toma de una de las clásicas que representa a BCN en todo el mundo. Ah Gaudi !! 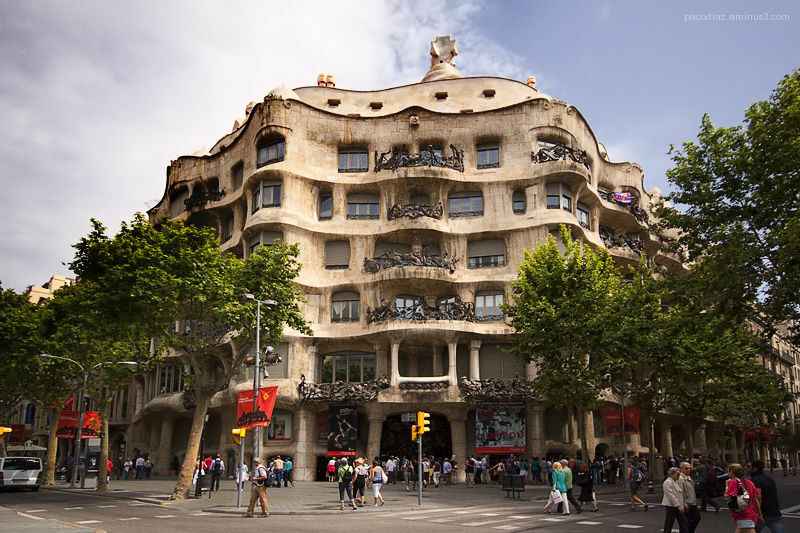 I love La pedrera ! Nice shot Paco ! Totally amazing place. Your photo is super! Excellent photo. What a gorgeous architecture . Love these balconies ! A very cool shot and such interesting architecture. Bravo! L'architecture de Gaudi est toujours surprenante mais c'est vraiment intéressant. Il va vraiment faloir que je consacre un grand WE à Barcelone un de ces jours. this reminds me that i need to get to Spain!!! gorgeous shot Paco! !